We've seen your remarkable dedication firsthand and we're proud to show our appreciation. So we'd like to help you transform your school lounge to extraordinary. Create a cheerful, restful environment where you can collaborate with colleagues, nurture your creativity, or just plain catch your breath. You deserve a restful environment where you can nurture your creativity or just plain catch your breath. "You've made a huge difference in how our day starts and finishes." Deidre Murphy, Quartz Hill E.S. "...That's when our lives changed and when I found out that we won, I couldn't believe it!" Sue O'Connor, Lake Hiawatha E.S. 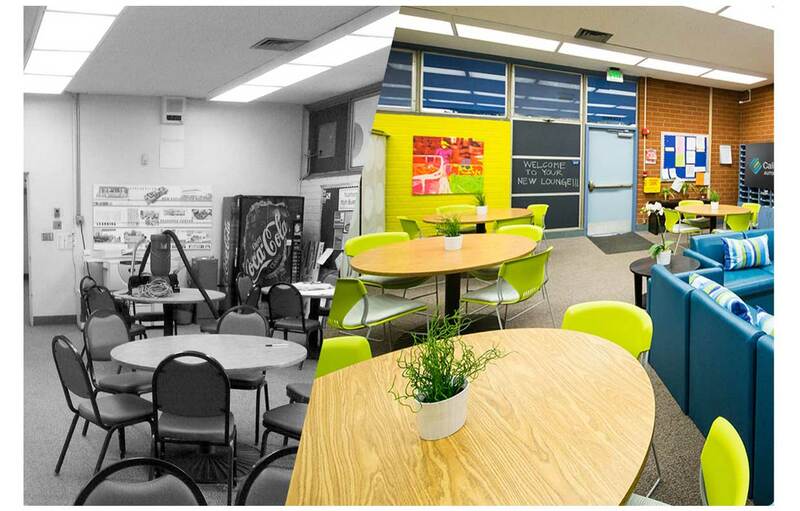 Enter today to win a School Lounge Makeover valued at $7,500 and tell all your colleagues to do the same. The more entries submitted from your school, the greater your chances of winning. Questions regarding this contest may be directed to California Casualty Management Company ("California Casualty") at (888) 229-7529. Unless otherwise noted, a contestant may only submit one entry, but a school can have multiple entries. Entries must be received by California Casualty by the specified drawing date to be eligible for the indicated drawing. or are libelous or defamatory.